Serving patrons since 1993 – 22 years and counting – The Manor Bistro (@manorbistroYEG) has been a mainstay in the High Street area of Edmonton. I was only seven when it first opened, so I can see why it has become a neighbourhood institution over time. 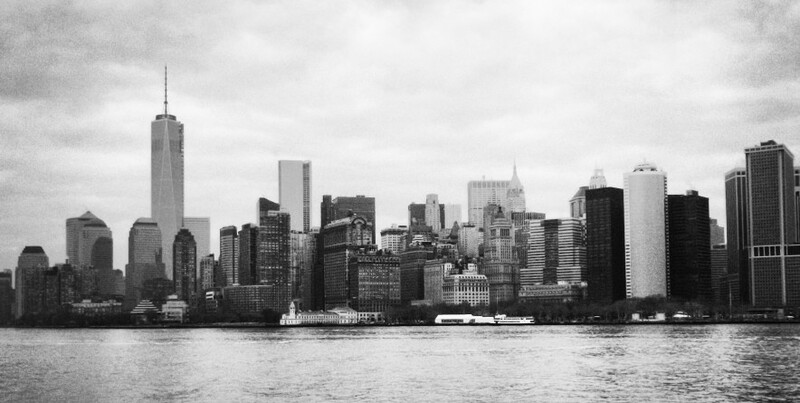 After all, I lived within a five minutes’ drive until I decided to move out and purchase my own condo in the south side of the city. The new corner I call home is still in constant development and it’s only just beginning to gain some character and choice in the food department. Unfortunately, it really does take a long time to build the kind of community that is seen in Glenora and Oliver. The majority of choices in Terwillegar and Windermere are chains or franchises, so I now realize – more than ever – how lucky we were to have places like The Manor nearby when I was growing up. It had been ages since I had dined there. However, my good friend’s bachelorette party was held at the establishment last August, and my mom was given a gift card for Chinese New Year this February, which she decided to use to treat my dad and I to lunch. We happened to be there on a Saturday, Valentine’s Day no less, so it was fairly busy. A parking spot was found just to the side of the building, and of course, we had called ahead to make a reservation (or book through OpenTable, if you prefer), so we didn’t have any problems getting a table. The server/hostess was friendly as she greeted and seated us. Another view of the main floor dining room. Specials are listed on the board above the mantle. A bottle of Mill St. Organic. The sunlit interior of the restaurant, which is located in a house. Looking at the restaurant menu, I’d call the current selection a cultural mix of comfort cuisine because there’s everything from nasi goreng (clocking in at No. 61 on the The Tomato‘s top 100 list for 2015; they also came in at No. 26 & No. 28 for their cocktails in 2013) to beef bourguignon to schnitzel. It’s actually quite a succinct list of items, but it does span the globe a bit in terms of flavours and techniques. On this particular occasion, I waffled between a few items, yet ultimately, I decided to go with the king of comfort food: mac and cheese with added braised beef short rib. 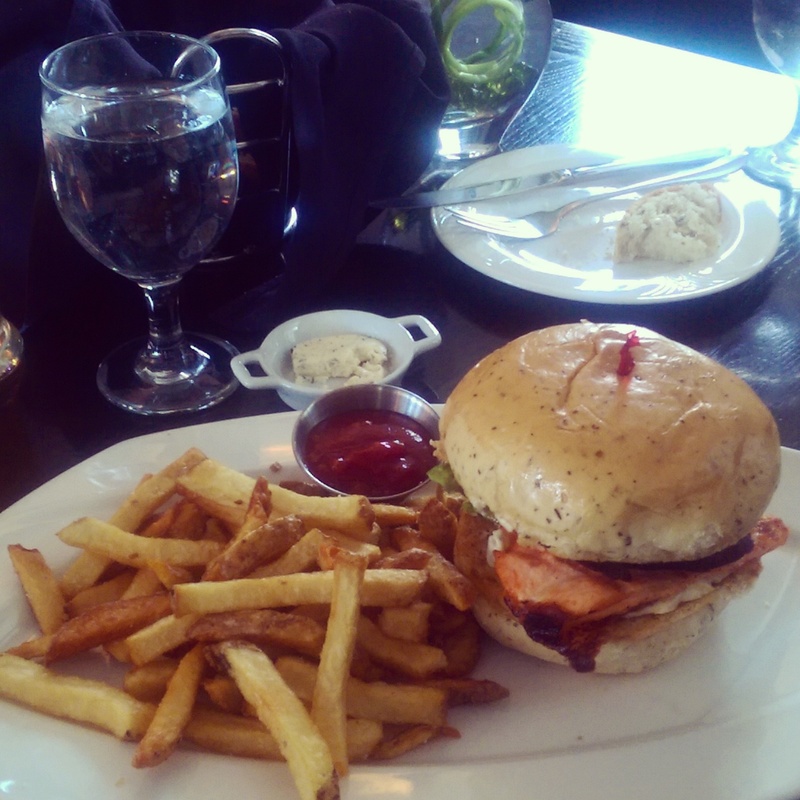 My dad ordered the schnitzel sandwich with a side of roast pepper chorizo soup, and my mom chose the salmon sandwich with fresh cut fries. While we waited for our food to be prepared, we were treated to a basket of warm bread with herbed butter, which I really didn’t need to eat, but enjoyed nonetheless (sue me…I love my carbs). Our mains followed shortly after; we were actually surprised at how quickly everything was prepared. Fresh bread and herbed butter to start. Mac and cheese with added braised beef short rib. The mac and cheese was served in an iron skillet, which kept the plate hot and the cheesy sauce creamy. It was a rich dish, so I wasn’t disappointed that this was portioned smaller. At $13 without the meat or $17 with, it really isn’t badly priced. The braised beef was wonderfully marinated and tender, the meat shredding easily with just a fork. An extra side of bread was included, and despite having eaten a couple of slices already, I proceeded to top the accompanying mini loaf with cheese and beef. It was excellent and my leftovers were just as good when reheated for dinner later that evening. 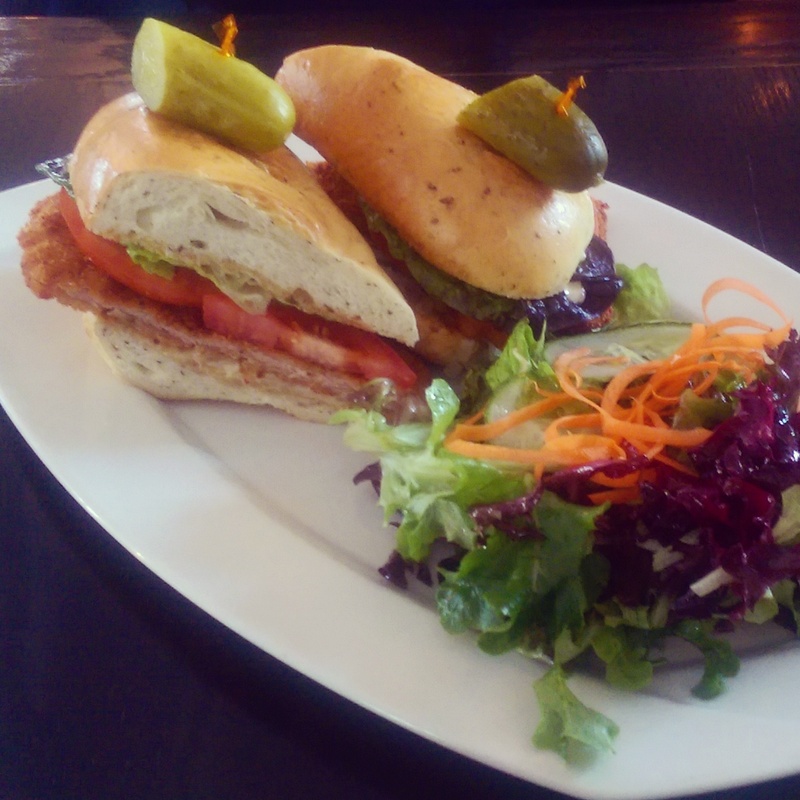 My dad’s pork schnitzel sandwich. I sampled my dad’s schnitzel sandwich, which consisted of breaded pork tenderloin, Dijon, tomato, lettuce and Swiss cheese. The schnitzel was evenly cooked and lightly breaded, so it wasn’t heavy, and the simple toppings made for a delectable, if not subtle winner. After half a sandwich and the bowl of soup, my dad packed up the remaining portion for later. The succulent salmon in my mom’s sandwich was fabulous. One of the worst atrocities in the kitchen is overcooking your meat or fish, but this was perfect. Topped with pickled onion, lettuce, tomato and beet-barley relish, it was a tasty combination of earthy and tangy flavours. The portion size of the salmon was generous as well. Again, leftovers were to be had. Stuffed to the brim, we had no room for dessert. Although I will say that the tray being shown to the adjacent table was very tempting. We’ll just have to go back to The Manor another time to indulge. This restaurant has obviously stood the test of time. It has evolved with the seasons, the times and its customers to remain a constant in an area that has seen plenty of change over the years. What I like about the eatery’s atmosphere is that it is at once classy, but also laid back. It’s not stuffy, and neither is the food. 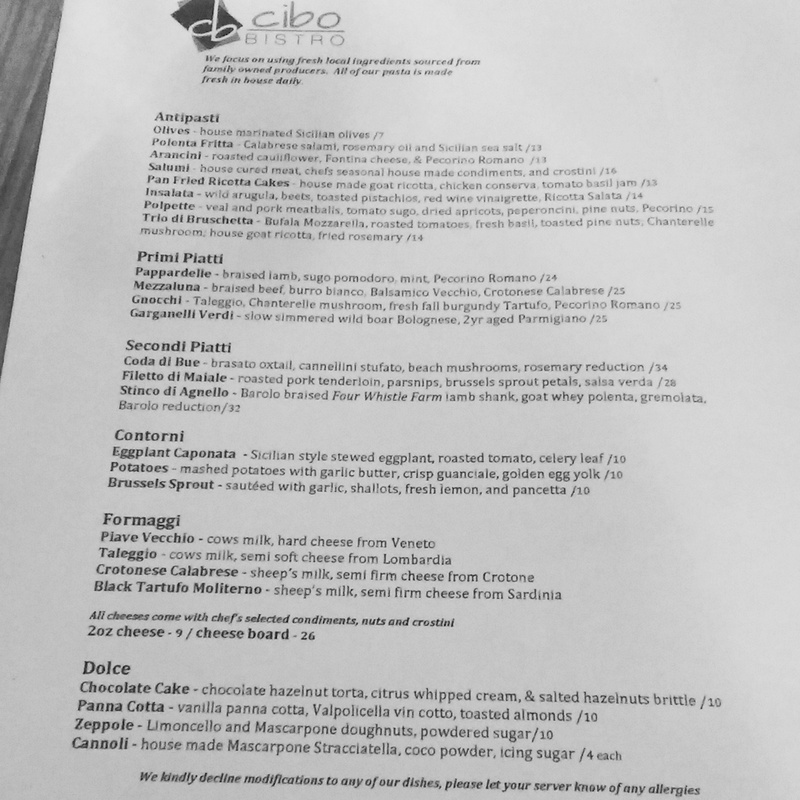 I think it was still summertime when my friend and I first attempted to visit Cibo Bistro (@cibobistroedm), only to find that they were closed on Mondays. Since we had to postpone our meal there, it took us quite a bit of time to circle back around to the idea. It wasn’t until mid-November when we finally made a point of going to the restaurant again. Located on 104 Avenue in Oliver Village between Safeway and MacEwan Residences, it’s slightly tucked away from the hustle and bustle of one of downtown Edmonton’s main arteries. I had made a reservation through OpenTable about a week or two in advance, but, as my friend was running late at the office, I called to have our booking pushed back. The hostess that I spoke to said it wasn’t an issue as there weren’t any conflicting reservations within that time frame. The two of us eventually made it there at about 6:15pm, and I was surprised to see, as the server led us to our table, that the place was still empty, save for the semi-private room near the back (although, it was pretty much full by the time we left an hour and a half later). With maybe just over a dozen tables in the space, it’s not large by any means, but still likely seats more than the city’s other lauded Italian restaurant, Corso 32 (read my review). Unlike Corso, however, the dimly lit space of Cibo Bistro looks a little more traditional with earth tones, leather upholstered chairs, cobble-like tiled floors, stone tiled walls and paintings of Italy. 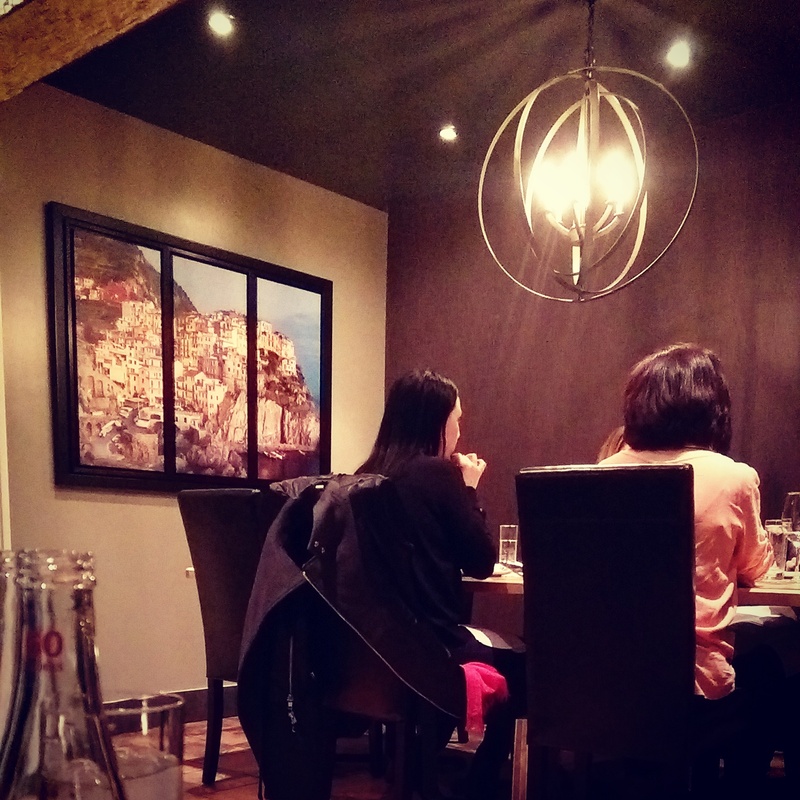 The interior of Cibo Bistro. The servers’ counter and a peek into the kitchen. As we perused the menu, I couldn’t help but notice the similarity between its layout and the offerings of Corso 32. That means I was apt to do a comparison by sampling a few items, so I could truly see the difference. Both have made The Tomato‘s top 100 list for two years in a row. Corso has been No. 1 each time with Cibo trailing just a few spots behind (No. 6 in 2013 and No. 4 in 2014). Arancini is one of my friend and I’s favourite Italian dishes. Since we had eaten that at Corso, it was a no-brainer to use that as a starting point for our showdown. That, along with the Salumi, served as our appetizers. As far as arancini go, they are considered an indulgent antipasti because they can be quite heavy and filling. It’s essentially risotto that has been battered and fried until a crisp outer shell is formed. The filling at Cibo is mixed with roasted cauliflower and Fontina cheese and, once cooked, is generously sprinkled with freshly grated Pecorino Romano. I’m not exactly sure why, but I think that, even with all the rice and cheese, there was a lightness to these arancini that the ones I ate at Corso didn’t have. The bowl we received had 6 to 7 arancini, which we shared. The breading was perfectly fried whereas Corso’s were a little overdone, making the shell harder to break. The cauliflower added a little more texture to the risotto, so it wasn’t all just mush, and the cheese was nicely melted inside. I also believe that these ones were a lot less salty. A broken arancini filled with Fontina cheese and roasted cauliflower, and a slice of crostini topped with salumi and shaved truffle. A full bowl of the Arancini. The amazing Salumi and crostini platter. The salumi platter that evening was a steak tartar with shaved truffle served with a side of crostini. This was probably the best dish of the evening, no doubt about it. They say the meats are cured in-house, and the tartar was prepared so well that it literally melted in your mouth. Paired with the shaved truffle, this was a completely decadent starter. I would have gladly eaten that has my main meal. The board came with 6 pieces of crostini and there was enough tartar provided that we weren’t sparingly spreading it on the bread. In fact, I was piling the tartar on thick, so I have to say that this selection was worth it. For our entrees, we had a harder time deciding. Our server was excellent and, to help, she described, in detail, each of the pasta dishes on the menu, including that evening’s special. 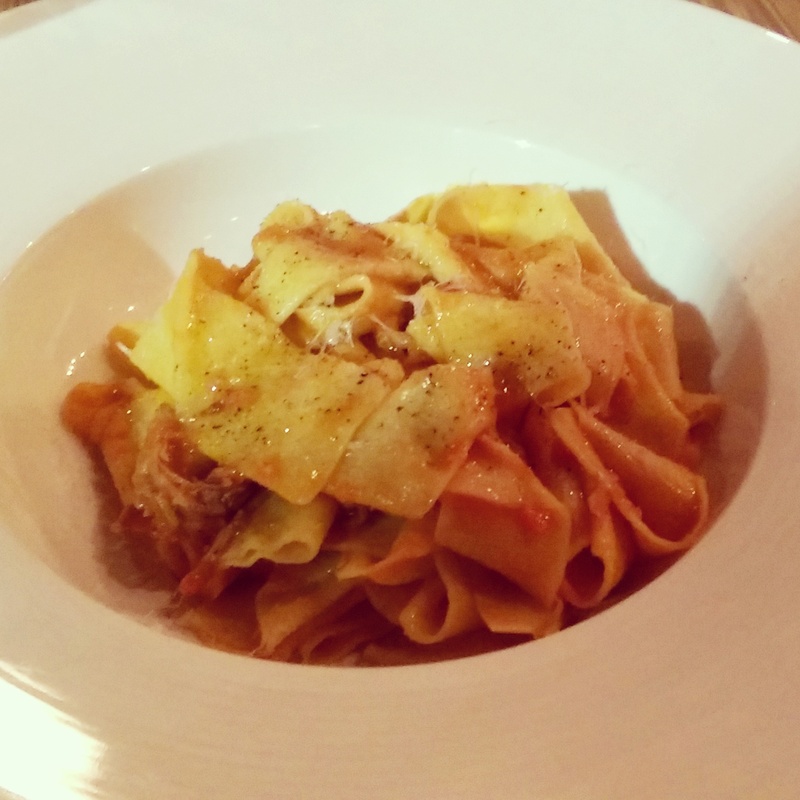 We finally made our choices – I ordered the Mezzaluna and my friend chose the Pappardelle. 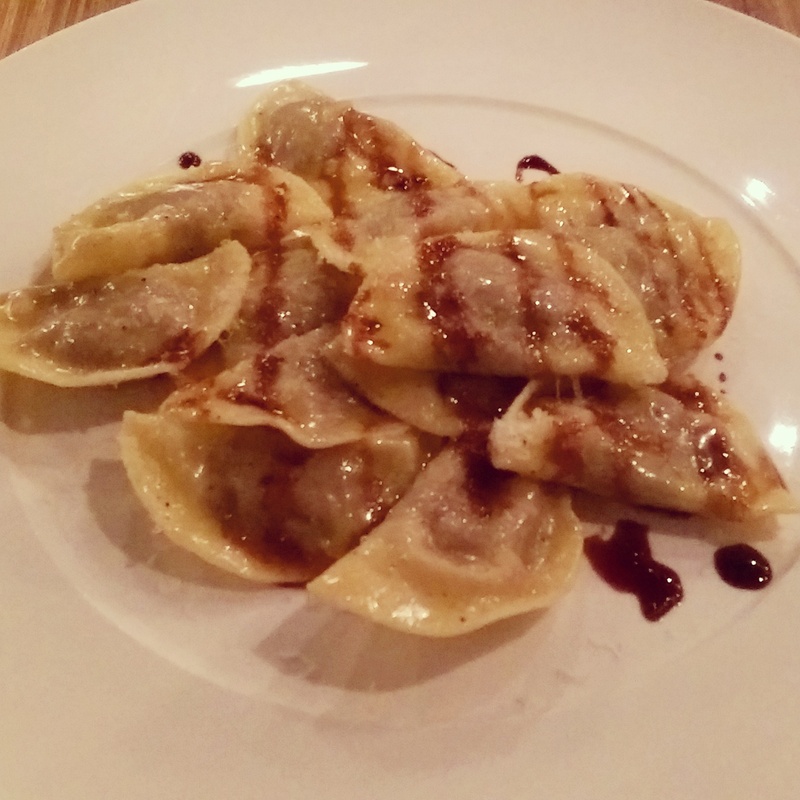 The Mezzaluna was ravioli stuffed with braised beef that is cooked until tender and then pureed, so it can be stuffed inside fresh, made from scratch pasta. The pasta shells were thin and prepared al dente. The sauce was a burro bianco (white butter) with Balsamico Vecchio (aged balsamic) and Crotonese Calabrese cheese, which was flavourful, but felt delicate. I particularly loved the used of the balsamic as a dressing, something that I hadn’t had in a long time. The sauce and the beef played off one another really well, so much so that I wanted more as soon as I polished off my plate. The Pappardelle consists of fat ribbons of fresh pasta bathed in tomato sauce and served with braised lamb, mint and Pecorino Romano cheese. I had just one mouthful of the dish and the pasta had just the right amount of bite. The lamb was succulent and the sauce was subtle. Unfortunately, we did not have room for dessert on this occasion. Plus, we were in a bit of a rush to make it to book club, but I will say that after our trip to Las Vegas and our meals at Giada in that city, had I been able to manage some sweets, I would have gone for the Zeppole (Limoncello and Mascarpone doughnuts dusted with powdered sugar). They’re certainly on my list for next time! In the end, and I’ve given this a lot of thought over the last month, I’m inclined to say that, while Corso was excellent, I honestly think that my meal at Cibo was a tad better. And, I feel like that says a lot. The pair of restaurants has a lot going for them – fantastic food, fresh, housemade dishes, wonderfully knowledgeable staff – yet they’re also hindered (arguably by some) by small spaces that make them seem exclusive when, in fact, they’re not. They’re friendly, intimate atmospheres that are very welcoming, so perhaps it comes down to preference which one you would prefer. Based on my singular visits to Cibo and Corso, I found them both to be great hangouts. They’re equally quiet in terms of ambiance, making it easy to converse with your dining companions, which is a big pro nowadays in a world where dance music seems to be pumping everywhere else. The semi-private room at the back. A great place for a small group to have fantastic conversation. After a few weeks of contemplation, my companion critic for that night and I agreed. Until I have a chance to revisit each, I cannot say with absolute certainty which will come out on top a year or two from now. Only time will tell. One of my friends who had dinner with me at Corso said that our meal there was one of the best she’s ever had. I’d be curious to see her thoughts of Cibo and her comparisons to Corso. Nonetheless, examining my own experience of the food, which, of course, is the foundation of a stellar restaurant, I believe that Cibo has won my heart and my stomach. That is not to say I won’t be eating at Corso again, because I will, but contrary to what every other review or person has told me, Cibo is going to be my personal number one for now. For a more in-depth look at this establishment’s involvement in the local community and its efforts towards sustainability visit The Local Good to read my profile of Cibo Bistro.